Sometimes, you just don’t have the time to eat at home or to prep your own breakfast. Whether that be because the snooze button tempted you a little too strongly, you’re feeling a little under the weather or… well, you just couldn’t be bothered (we’ve all been there). It can be really difficult to find something in a fast food joint that won’t end up starting your day feeling sluggish and bloated. And without the right information, a lot of us do end up just grabbing that McMuffin without thinking twice. Especially when just a smoothie isn’t going to hit the spot - I know in Winter I much prefer a warm, cooked breakfast. Well, thanks to the amazing new selections offered by our food chains this doesn’t have to be the case anymore. I’ve put together some of my favourite breakfast options for vegans, veggies and meat eaters alike. Luckily, food establishments are so much more clued up on allergies and intolerances now that even those of us who can’t eat gluten, dairy or other common ingredients can enjoy something that both tastes awesome, and is good for us. I’ve selected items from the menus of fast food chains that are available in most towns and cities, so there really should be something for everyone. This is always my go-to breakfast when I’m in a rush. This mainly happens to be when I’m in a train station or airport pretty early. It’s a nutritious way to fuel your day, making sure you don’t crash a couple of hours later thanks to the slow energy release of the oats and quinoa. Dairy free, gluten free and a taste sensation, it’s an amazing choice for vegans and allergy sufferers. Pret also offer free toppings to choose from, including honey, berry compote and a seed mix. Naturally I use all three but if you prefer your porridge savoury rather than sweet, the seeds alone add a great flavour and extra boost of vitamins. Leon is a great fast food chain that offer healthy and delicious meals. They are super conscious of allergies and have plenty of vegan options, and their ethos of making healthier fast food more accessible is a life saver. 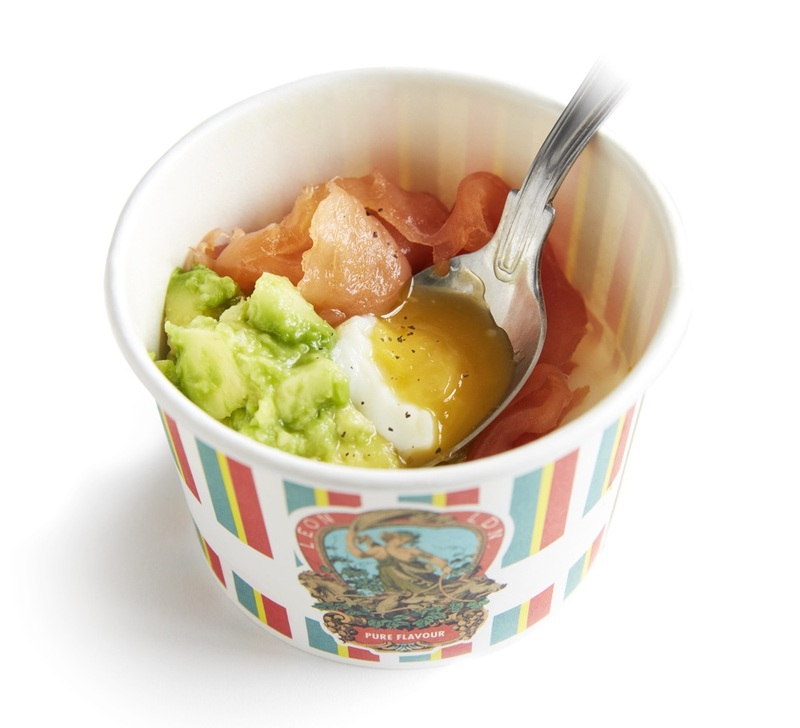 Their smoked salmon and avocado egg pot tastes amazing, and is a perfect and comforting warm bowl of goodness to eat on the go. Another breakfast that contains nutritious ingredients to fuel your day and give you long lasting energy that will keep your blood sugars steady, and avoid the mid morning crash that makes you reach for the office biscuits. It’s great to see Starbucks offering breakfast alternatives for plant based eaters, and this wrap doesn’t hold back on the ingredients. Featuring a tofu scramble, chipotle beans, mushrooms and tomatoes all in a spinach wrap, they’ve been creative and developed a grab and go meal that doesn’t sacrifice flavour for ethics. I’ll be featuring both lunch and dinner options in future posts, hopefully helping you all to make easier decisions when stuck in a tight place, that will help you feel great about yourself whilst enjoying a treat at the same time. Because we all deserve for someone else to cook our food every now and then.